Message information such as system operations or malfunctions is indicated in the display. Check the vehicle condition or have the vehicle inspected at an Authorized Mazda Dealer according to the indication. The light illuminates when the parking brake is applied with the ignition switched to START or ON. It turns off when the parking brake is fully released. If the light stays on after the parking brake is fully released there may be a problem with the brakes. Drive to the side of the road and park off the right-of-way. You may notice that the pedal is harder to depress or that it may go closer to the floor. In either case, it will take longer to stop the vehicle. 1. With the engine stopped, open the hood and check the brake fluid level immediately, and then add fluid if required . 2. After adding fluid, check the light again. If the warning light remains on, or if the brakes do not operate properly, do not drive the vehicle. Have it towed to an Authorized Mazda Dealer. Even if the light turns off, have your brake system inspected as soon as possible by an Authorized Mazda Dealer. Having to add brake fluid is sometimes an indicator of leakage. Consult an Authorized Mazda Dealer as soon as possible even if the brake light is no longer illuminated. 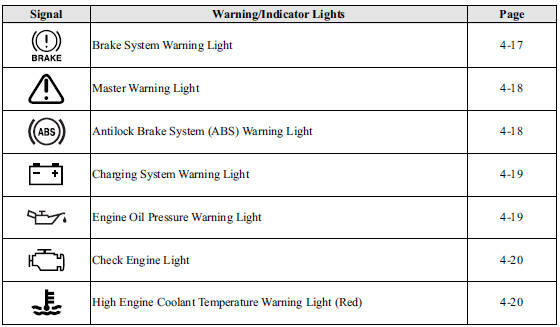 Driving with the brake system warning light illuminated is dangerous. It indicates that your brakes may not work at all or that they could completely fail at any time. If this light remains illuminated, after checking that the parking brake is fully released, have the brakes inspected immediately. This warning light stays on for a few seconds when the ignition is switched ON. The light illuminates continuously if any one of the following occurs. Consult an Authorized Mazda Dealer. • There is a malfunction in the battery management system. • There is a malfunction in the brake switch. The warning light stays on for a few seconds when the ignition is switched ON. If the ABS warning light stays on while you're driving, the ABS control unit has detected a system malfunction. If this occurs, your brakes will function normally as if the vehicle had no ABS. Should this happen, consult an Authorized Mazda Dealer as soon as possible. When the engine is jump-started to charge the battery, uneven rpm occurs and the ABS warning light may illuminate. If this occurs, it is the result of the weak battery and does not indicate an ABS malfunction. If the electronic brake force distribution control unit determines that some components are operating incorrectly, the control unit may illuminate the brake system warning light and the ABS warning light on simultaneously. The problem is likely to be the electronic brake force distribution system. 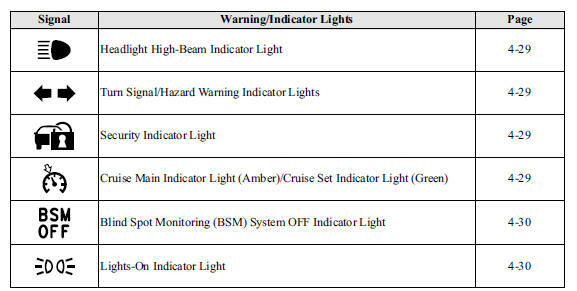 Driving when the brake system warning light and ABS warning light are illuminated simultaneously is dangerous. When both lights are illuminated, the rear wheels could lock more quickly in an emergency stop than under normal circumstances. This warning light illuminates when the ignition is switched ON and turns off when the engine is started. If the warning light illuminates while driving, it indicates a malfunction of the alternator or of the charging system. Drive to the side of the road and park off the right-of-way. Consult an Authorized Mazda Dealer. Do not continue driving when the charging system warning light is illuminated because the engine could stop unexpectedly. This warning light indicates low engine oil pressure. 1. Drive to the side of the road and park off the right-of-way on level ground. 2. Turn off the engine and wait 5 minutes for the oil to drain back into the oil pan. 3. Inspect the engine oil level . If it's low, add the appropriate amount of engine oil while being careful not to overfill. 4. Start the engine and check the warning light. If the light remains illuminated even after you add oil, stop the engine immediately and have your vehicle towed to an Authorized Mazda Dealer. Do not run the engine if the oil pressure is low. It could result in extensive engine damage. This indicator light illuminates when the ignition is switched ON and turns off when the engine is started. If this light illuminates while driving, the vehicle may have a problem. It is important to note the driving conditions when the light illuminated and consult an Authorized Mazda Dealer. • The fuel tank level being very low or approaching empty. • The engine's electrical system has a problem. • The emission control system has a problem. • (U.S.A. and Canada) The fuel-filler cap is missing or not tightened securely. If the check engine light remains on or flashes continuously, do not drive at high speeds and consult an Authorized Mazda Dealer as soon as possible. When the ignition is switched ON, the light illuminates momentarily and then turns off. The light flashes when the engine coolant temperature is extremely high, and illuminates when the engine coolant temperature increases further. Drive slowly to reduce engine load until you can find a safe place to stop the vehicle and wait for the engine to cool down. This indicates the possibility of overheating. Park the vehicle in a safe place immediately and stop the engine. Do not drive the vehicle with the high engine coolant temperature warning light illuminated. Otherwise, it could result in damage to the engine. • Illuminates when there is an abnormality with the AWD system. • Illuminates if there is too much difference in tire radius between the front and rear wheels. • Flashes when the differential oil temperature is abnormally high. • Flashes when there are continually large differences between front and rear wheel rotation, such as when trying to pull away from an icy surface, or when trying to extricate the vehicle from mud, sand or similar conditions. If the AWD warning light illuminates, contact an Authorized Mazda Dealer. Park the vehicle in a safe place. After a few moments, if the warning light stops flashing, you can resume driving. If the light does not stop flashing, contact an Authorized Mazda Dealer. The light illuminates when the transaxle has a problem. If the automatic transaxle warning light illuminates, the transaxle has an electrical problem. Continuing to drive your Mazda in this condition could cause damage to your transaxle. Consult an Authorized Mazda Dealer as soon as possible. This indicator light illuminates when the ignition is switched ON, and turns off when the engine is started. The power steering malfunction indicator light illuminates if there is a malfunction with the power steering while the engine is running. If the indicator light illuminates, park the vehicle in a safe place immediately and stop the engine. If the indicator light does not turn off even if the engine is restarted afterwards, consult an Authorized Mazda Dealer. • If the indicator light illuminates, the power steering will not operate normally. If this happens, the steering wheel can still be operated, however, the operation may feel heavy compared to normal, and the steering wheel could vibrate when turning. • Repeatedly jerking the steering wheel left and right while the vehicle is stopped or moving extremely slowly will cause the power steering system to go into protective mode which will make the steering feel heavy, but this does not indicate a problem. If this occurs, park the vehicle safely and wait a few seconds for the system to return to normal. If the air bag/front seat belt pretensioner system is working properly, the warning light illuminates when the ignition is switched ON or after the engine is cranked. The warning light turns off after a specified period of time. 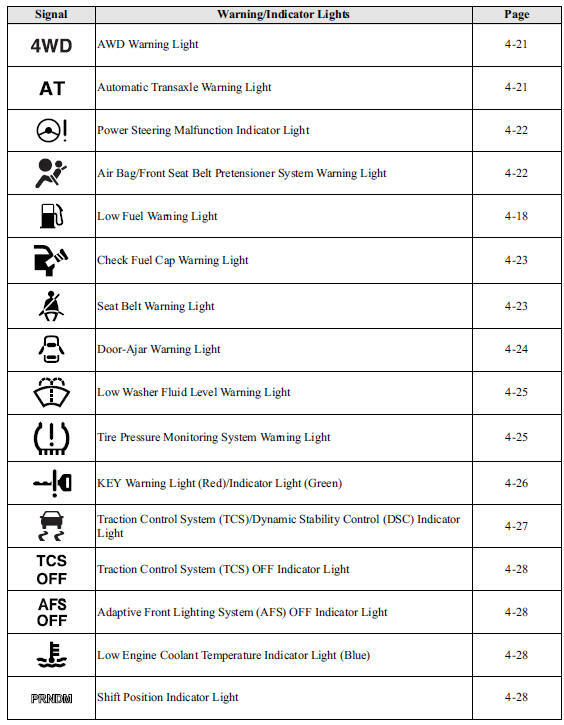 A system malfunction is indicated if the warning light constantly flashes, constantly illuminates or does not illuminate at all when the ignition is switched ON. If any of these occur, consult an Authorized Mazda Dealer as soon as possible. The system may not operate in an accident. Self-servicing or tampering with the systems is dangerous. An air bag/ pretensioner could accidentally activate or become disabled causing serious injury or death. This warning light signals that the fuel tank will soon be empty. Refuel as soon as possible. This warning light illuminates for a few seconds when the ignition is switched ON. If the check fuel cap warning light illuminates while driving, the fuel-filler cap may not be installed properly. Stop the engine and reinstall the fuel-filler cap. Refer to Fuel-Filler Cap 4. The seat belt warning light illuminates if the driver or front passenger's seat is occupied and the seat belt is not fastened with the ignition switched ON. The seat belt warning light illuminates if the driver's seat is occupied and the seat belt is not fastened with the ignition switched ON. Consult an Authorized Mazda Dealer to deactivate or restore the belt reminder. Though the belt reminder can be deactivated, doing so will defeat the purpose of the system to warn the driver and the front passenger in the event that their seat belts are not fastened. For the safety of the driver and front passenger, Mazda recommends not deactivating the belt reminder. If the vehicle is driven with the driver or front passenger's seat belt unfastened, the seat belt warning light illuminates and a warning beep sounds. Some models do not have the seat belt reminder function for the front passenger's seat. If the driver or front passenger's seat belt is unfastened (only when the front passenger seat is occupied) and the vehicle is driven at a speed faster than about 20 km/h (12 mph), the warning light will flash and a beep sound will be heard. After a short time, the warning light stops flashing, but remains illuminated, and the beep sound stops. Until a seat belt is fastened or a given period of time has elapsed, the beep sound will not stop even if the vehicle speed falls below 20 km/h (12 mph). • The warning light flashes and a beep sound will be heard for about 6 seconds if the driver's seat belt is not fastened when the ignition is switched ON. • If a driver or front passenger's seat belt is unfastened after the beep sound turns off (warning light remains illuminated), and the vehicle speed exceeds 20 km/h (12 mph), the warning light flashes and beep sound activates again. • Placing heavy items on the front passenger seat may cause the front passenger seat belt warning function to operate depending on the weight of the item. • To allow the front passenger seat weight sensor to function properly, do not place and sit on an additional seat cushion on the front passenger seat. The sensor may not function properly because the additional seat cushion could cause sensor interference. • When a small child sits on the front passenger seat, it is possible that the warning light will not operate. This warning light illuminates when any door or the liftgate is not securely closed. Close the door or the liftgate securely before driving the vehicle. This warning light indicates that little washer fluid remains. Add fluid . The warning light illuminates and a beep is heard when tire pressure is too low in one or more tires, and flashes when there is a system malfunction. If the tire pressure monitoring system warning light illuminates or flashes, or the tire pressure warning beep sound is heard, it is dangerous to drive the vehicle at high speeds, or perform sudden maneuvering or braking. Vehicle drivability could worsen and result in an accident. To determine if you have a slow leak or a flat, pull over to a safe position where you can check the visual condition of the tire and determine if you have enough air to proceed to a place where air may be added and the system monitored again by an Authorized Mazda Dealer or a tire repair station. Do not ignore the TPMS Warning Light: Ignoring the TPMS warning light is dangerous, even if you know why it is illuminated. Have the problem taken care of as soon as possible before it develops into a more serious situation that could lead to tire failure and a dangerous accident. When the warning light illuminates, and the warning beep sound is heard (about 3 seconds), tire pressure is too low in one or more tires. Adjust the tire pressure to the correct tire pressure. Refer to the specification charts . • Perform tire pressure adjustment when the tires are cold. Tire pressure will vary according to the tire temperature, therefore let the vehicle stand for 1 hour or only drive it 1.6 km (1 mile) or less before adjusting the tire pressures. When pressure is adjusted on hot tires to the cold inflation pressure, the TPMS warning light/beep may turn on after the tires cool and pressure drops below specification. Also, an illuminated TPMS warning light, resulting from the tire air pressure dropping due to cold ambient temperature will remain illuminated even if the ambient temperature rises. In this case, it will also be necessary to adjust the tire air pressures. If the TPMS warning light illuminates due to a drop in tire air pressure, make sure to check and adjust the tire air pressures. If the warning light illuminates again even after the tire pressures are adjusted, there may be a tire puncture. Replace the punctured tire with the temporary spare tire . If the tire pressure monitoring system has a malfunction, the tire pressure warning light flashes for about 1 minute when the ignition is switched ON and then continues illuminating. Have your vehicle checked by an Authorized Mazda Dealer as soon as possible. This indicator has two colors. If any malfunction occurs in the keyless entry system, it illuminates continuously. If the key warning indicator light illuminates or the push button start indicator light (amber) flashes, the engine may not start. If the engine cannot be started, try starting it using the emergency operation for starting the engine, and have the vehicle inspected at an Authorized Mazda Dealer as soon as possible. • Under the following conditions, the KEY warning light (red) flashes to notify the driver that the ignition cannot be switched from off. • The key battery is dead. • The key is not within operational range. • The key is placed in areas where it is difficult for the system to detect the signal . • A key from another manufacturer similar to the key is in the operational range. The ignition has not been switched off and all the doors and the liftgate are closed after removing the key from the vehicle. Because the key utilizes low-intensity radio waves, the Key Removed From Vehicle Warning may activate if the key is carried together with a metal object or it is placed in a poor signal reception area. When the brake pedal is depressed with an automatic transaxle or the clutch pedal is depressed with a manual transaxle, the system confirms that the correct key is inside the vehicle, the KEY indicator light (green) illuminates, and the engine can be started . When the ignition is switched from ON to off, the KEY indicator light (green) flashes for approximately 30 seconds indicating that the remaining battery power is low. Replace with a new battery before the key becomes unusable. Refer to Replace Electrical Battery on . This indicator light stays on for a few seconds when the ignition is switched ON. If the TCS or DSC is operating, the indicator light flashes. If the light stays on, the TCS, DSC or the brake assist system may have a malfunction and they may not operate correctly. Take your vehicle to an Authorized Mazda Dealer. • In addition to the indicator light flashing, a slight lugging sound will come from the engine. This indicates that the TCS/DSC is operating properly. • On slippery surfaces, such as fresh snow, it will be impossible to achieve high rpm when the TCS is on. This indicator light stays on for a few seconds when the ignition is switched ON. It also illuminates when the TCS OFF switch is pressed and TCS is switched off. Refer to TCS OFF Switch 3. If the light remains illuminated and the TCS is not switched off, take your vehicle to an Authorized Mazda Dealer. The DSC may have a malfunction. This indicator light illuminates briefly when the ignition is switched ON, and then turns off. Pressing the AFS OFF switch cancels the AFS function and illuminates the indicator light. The indicator light flashes continuously if the system is malfunctioning. Consult an Authorized Mazda Dealer. • Even if the AFS is not operating due to some malfunction, the normal headlight function is still operable. • If there is a malfunction with the headlight auto-leveling function, the indicator light flashes. The light illuminates continuously when the engine coolant temperature is low and turns off after the engine is warm. If the low engine coolant temperature indicator light remains illuminated after the engine has been sufficiently warmed up, the temperature sensor could have a malfunction. Consult an Authorized Mazda Dealer. This indicates the selected shift position. In manual shift mode, the “M” of the shift position indicator illuminates and the numeral for the selected gear displays. • The high-beam headlights are on. • The turn signal lever is in the flash-topass position. When operating the turn signal lights, the left or right turn signal indicator light flashes to indicate which turn signal light is operating . When operating the hazard warning lights, both turn signal indicator lights flash . If an indicator light remains illuminated (does not flash) or if it flashes abnormally, one of the turn signal bulbs may be burned out. Consult an Authorized Mazda Dealer. This indicator light starts flashing every 2 seconds when the ignition is switched from ON to OFF and the immobilizer system is armed. The light stops flashing when the ignition is switched ON with the correct key. At this time, the immobilizer system is disarmed and the light illuminates for about 3 seconds and then turns off. If the engine does not start with the correct key, and the security indicator light keeps illuminating or flashing, the system may have a malfunction. Consult an Authorized Mazda Dealer. The indicator light has two colors. The indicator light illuminates amber when the ON switch is pressed and the cruise control system is activated. The indicator light illuminates green when a cruising speed has been set. This indicator light illuminates for a few seconds when the ignition is switched ON. The BSM OFF indicator light illuminates when the BSM system is turned off by pressing the BSM OFF switch. The indicator light flashes if the BSM system has a malfunction. Consult an Authorized Mazda Dealer. If the vehicle is driven on a road with less traffic and few vehicles that the radar sensors can detect, the system may pause (The BSM OFF indicator light in the instrument panel flashes). However, it does not indicate a malfunction. 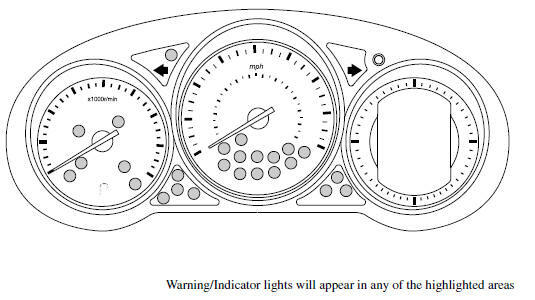 This indicator light illuminates when the exterior lights and dashboard illumination are on. The light continues to flash if the lighting system has a malfunction. Consult an Authorized Mazda Dealer.